A lightning-caused wildfire burning in the Kenai National Wildlife Refuge grew in size on Friday but firefighters were able to keep it from spreading south and west toward the Sterling Highway. As of 5:30 p.m., the East Fork Fire was estimated between 300-400 acres, according to the Alaska Division of Forestry. Most of the growth was to the north and northeast, away from the highway and the community of Sterling, which is approximately 4 ½ miles to the southwest. Light winds out of the south were steering the fire to the north and east. An air tanker and two water scooping planes bombed west and south sides of the fire with strategic water drops to steer it away from any values at risk while 19 firefighters on the ground made good progress establishing indirect line along the East Fork of the Moose River to keep the fire east of the river. As expected, fire activity increased in the afternoon with warmer, drier conditions, evidenced by a large smoke plume that is visible locally in Kenai and Soldotna, as well as from Anchorage across the Cook Inlet. Afternoon temperatures rose into the low 70s and the relative humidity dropped into the low 30 percent range. The most active edge of the fire on the north side produced extreme fire behavior as it burned through thick stands of mature black spruce, producing crowning and torching. Two more crews from the Alaska Division of Forestry and BLM Alaska Fire Service were ordered to the fire and will arrive late tonight to bolster ground forces tomorrow. Additional crews will be ordered as they are released from other fires in other parts of the state. The East Fork Fire was reported at 6:25 p.m. Thursday. The lightning-caused fire grew rapidly and was estimated at 100 acres by the time air attack personnel from Palmer arrived. The fire is located in a limited suppression area and the primary fuel type is black spruce with mixed hardwoods. 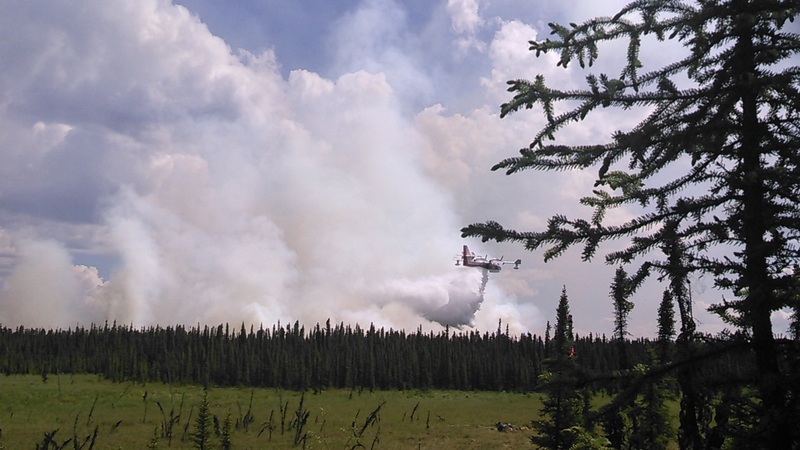 Given the volatility of black spruce, the fire exhibited extreme fire behavior Thursday night with crowning and 30- to 40-foot flame lengths in areas of black spruce. Due to the extreme fire behavior and the fire’s proximity to local infrastructure, the U.S. Fish and Wildlife Service made the decision to take suppression action on a portion of the fire. Water drops from aircraft are being used to support firefighting efforts on the ground. Retardant is not being used because of the fire’s proximity to an anadramous salmon stream. Retardant could be used if the fire poses a direct threat to values at risk but that is not the case at this time. The public is asked to please steer clear of crews working in the area and be aware of the potential for aircraft using Skilak Lake to scoop water. A temporary flight restriction (TFR) has been put in place over the fire area and pilots should check with the Federal Aviation Administration before flying in the area. More information on the TFR is available at http://tfr.faa.gov/tfr2/list.html. For more information, contact Alaska Division of Forestry public information officer Celeste Prescott at 907-244-9376. Information about the fire is also being posted on KPBOEM.blogspot.com.